Way before any of us were around, Cree, Blackfoot, and Sarcee tribes camped out and hunted on the land now preserved as Elk Island National Park, Canada’s oldest wildlife sanctuary. For hundreds of years, bison, moose, elk, coyotes, beavers, and many other native creatures roamed and settled in the area, which would eventually become nearly desolate due to over-hunting of specific species. 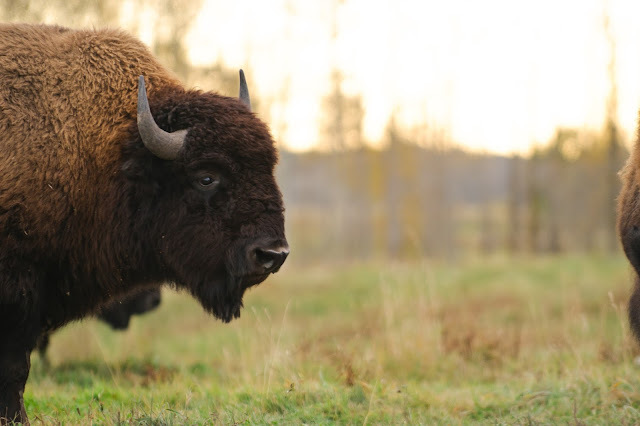 Bison are a common sight at Elk Island Park, just outside of Edmonton. It wasn’t until 1906 when five Fort Saskatchewan men pooled together $5,000 and petitioned the federal government to dedicate the land to an elk sanctuary, and by 1913 it was officially granted federal park status. It wasn’t until 1930, however, that the Canadian Parliament designated Elk Island an official National Park. Located just 35 kms east of Edmonton, Elk Island is Canada’s largest fully-enclosed park at 194 square kilometers, and is second only to Africa’s Serengeti for the highest number of hoofed wildlife. Actually, there’s an abundance of all sorts of wildlife at Elk Island, as well as endangered habitats like the aspen parkland and Boreal forest, 80 kms of hiking trail systems running alongside marshes and lakes, over 250 species of birds, and plenty of space for picnicking, canoeing, camping, snowshoeing, golfing, kayaking, birdwatching, cycling, cross country skiing, or just walking the dog.